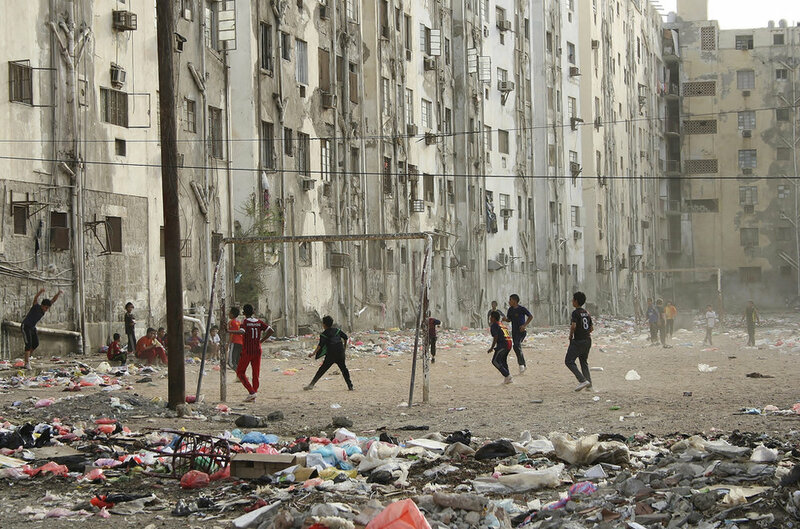 Children playing soccer at a playground in Yemen. A HUMANITARIAN DISASTER COULD LIKELY ESCALATE. Yemen is already considered by human rights organizations as being on the brink of a major crisis and that is without any major escalation. Now as the Saudi-backed coalition including the legitimate government is reaching Hodeida, the major port for humanitarian aid, which provides for fourth fifths of Yemenis. If they can take control of this over the Iranian-backed Houthi rebels, they may be able to force them into negotiations to end the conflict. While this would be a victory for the long-term welfare of the country, the road is treacherous. Houthis are not known to just give up and with mines planted around the port, the battle for it looks like it could put millions of lives in jeopardy. THE GREAT DEAL MAKER? NOT SO MUCH. President Donald Trump met North Korean leader Kim Jong un in Singapore to come to an agreement that would denuclearize the peninsula. Yet, they came away with an agreement that provided no more assurances than the agreement Kim Jong un had signed a month ago in South Korea, except for the United States halting joint military exercises with South Korea. Further, Kim was met with the praise of a celebrity in Singapore despite being one of the largest human rights violators living – that is not hyperbole. Predictably, Trump continued his affinity for authoritarianism, commending Kim for the job he has done in North Korea and unconventionally saluting a North Korean general. If there is to be true progress on denuclearization, it will likely be up to diplomatic efforts by Trump’s administration. AN ANCIENT BATTLE. The Republic of Macedonia and Greece are in the process of settling a decades-old dispute about the cultural appropriation of the name ‘Macedonia’, implying ownership of the historical region conquered by Alexander the Great. Macedonia will henceforth be called North Macedonia. While not everyone on either side are content with the change and it is not set in stone yet, this demonstrates tangible progress that will improve relations in the Balkans and Europe more broadly. Macedonia will now be able to join the European Union and NATO as Greece will no longer block its entrance. POPULISTS SHOWING THEIR POWER. Italy’s Deputy Prime Minister, Matteo Salvini, who is part of the governing populist coalition rejected a vessel carrying 629 people from docking at Italy’s ports. This is the first of such actions, but restricting illegal immigration is atop the coalition’s election promises. Luckily for the migrants, Spain quickly accepted them. As the summer begins, Italy will likely be asked to accept more of these migrants and if this is any indication, either they will be forced back to Northern Africa or other countries will be forced to make up for Italy’s refusal. Greeks already are not very pro-immigration from Northern Africa and this may wear on Spain’s surprising acceptance. Additionally, migration from Northern Africa is predicted to be a long-term problem, if the European Union wants to prevent any more dissidents, it better find a resolution sooner rather than later. TECHNOLOGICAL ADVANCES IN AFRICA SAVING LIVES. In recent years Malaria has dropped out of the top five for leading causes of death, but it still is taking hundreds of thousands of lives a year. In Uganda, where Brian Gitta is from, it is the leading cause of death. Brian Gitta has designed a device that can effectively and quickly analyze one’s blood through their skin with a laser to see if they have malaria. It is more reliable than the current method of drawing blood. While it still needs to go through trials to get approval, winning prize money from the Royal Academy of Engineering is helping Mr. Gitta get his design to the market. POPE FRANCIS PURGING THE CHILEAN CHURCH. After each of the 14 Chilean Catholic Bishops offered to resign after reports of large-scale sexual abuse throughout the Chilean Catholic Churches, Pope Francis has taken it a step further. He is purging leaders throughout the hierarchy and accepting multiple resignations. There is a 2300-page report that reveals a systematic covering up of rapes, molestations, and groping of minors. This included destroying of evidence, discrediting of accusers, and minimization of any cases that were publicized. The Pope has demonstrated his progressive beliefs time and time again - now he is cracking down on perhaps the most contentious issue in the Church. RUSSIA USING WORLD CUP TO SHOW OFF ITS PRESTIGE. With a million people set to visit Russia for the World Cup over the next month, Russia is looking to demonstrates itself as a rising great power. Despite its recent annexation of Crimea, assassination of a former Russian spy and meddling in Syria, President Putin wants Russia to be seen as a friendly nation. Smiling lessons have been taught to volunteers who will be in contact with tourists. Any threat of disruption including political rivals, rowdy ‘hooligans’, and freedoms have been repressed to avoid disorder. Putin would prefer the world see the beauty and strength of Russia rather than its politics. POLIO POPS UP IN VENEZUELA. The oil-rich, ailing state has experienced disintegration under President Maduro spread from political and economic disruption to medical. Cases of polio have been reported for the first time since 1991. It is unclear as to how the disease has surfaced again, but it illustrates how prolonged economic disruption can infiltrate other parts of society. Even more frightening is that Venezuela’s health care system is collapsing. Millions of babies have not been vaccinated for the disease. Additionally, there are over a million people who have fled and continue to flee the country. The chance of polio spreading throughout Latin America suggests that the instability in Venezuela could begin to impede the progress the rest of the region has made.